Prior to the settlement of Iowa, the state was almost completely covered by tallgrass prairie. These prairies maintained soils with high organic matter content and a lot of pore space. This is what created most of the dark, rich topsoil seen on Iowa’s landscape today! All of the pore spaces also allowed the landscape to absorb rainfall while shedding little runoff. Most rainfall infiltrated the soil, where it recharged groundwater flow. Iowa’s soil resources have been significantly altered by tillage based agricultural practices as well as land development in urban areas. Because of this, less rainfall infiltrates into the landscape leading to more surface runoff. Along with prairie, many wetlands also covered Iowa’s landscape. These wetlands allowed water to pool in areas and provided essential wildlife habitat. Unfortunately, most of these areas have now been drained for farming or development purposes. Because of the vast changes in the Iowa, many problems that are negatively affecting our environment have become evident. Below you will learn about some of the problems seen in the rural areas of the state. To learn about our urban problems, visit the “urban” page. 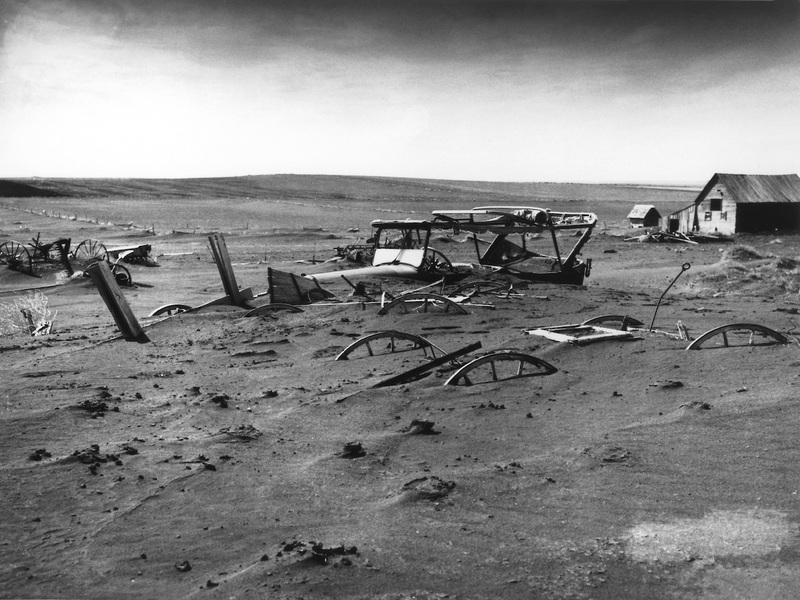 Erosion – Erosion of topsoil has been a prominent environmental concern since the dust bowl of the 1930s. 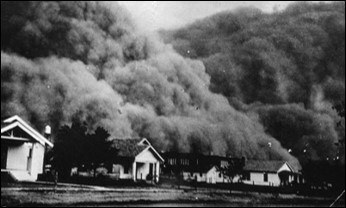 During this time, so much degradation was happing on the landscape due to intense tillage practices and exposed soil that the wind picked up and carried topsoil creating large dust storms. 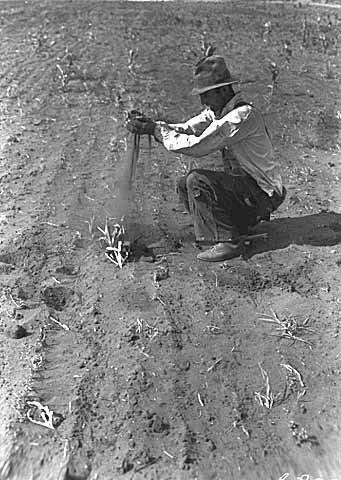 Following the dust bowl, the government and farmers realized how important it was to start putting measures in to place to protect our essential topsoil and not have a repeat of the dust bowl. 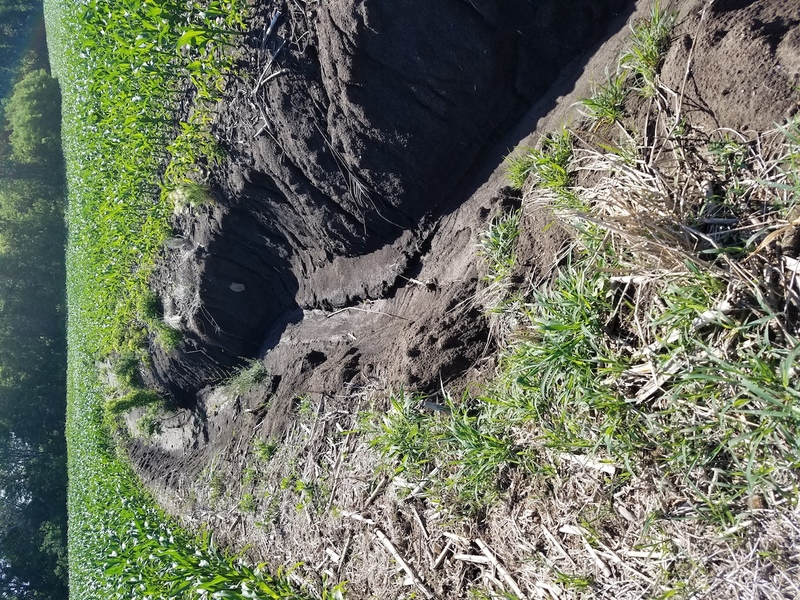 Even though we have made positive advances to combat erosion since then, soil loss is still occurring across Iowa. Movement of topsoil, or erosion, can happen in two main ways; water and wind. Wind erosion occurs when strong winds pick up small soil particles and carries them away from their current location. This is especially evident during the winter months when accumulated snow is black from the eroding topsoil. Even though wind does play a significant role in loss of topsoil, most of erosion in Iowa occurs by water. When it rains, soil is carried from fields and open lots and discharged into streams, rivers, and lakes. Sometimes, the flow of the water across the landscape is concentrated along one path causing large gullies and drop offs. These areas can be hazardous to machinery if not taken care of. Water erosion also causes the loss of banks along streams and rivers. During storm events, a surge of water rushes across the landscape and through the stream and river channels. This happens at such a quick and sudden rate that unstable soil is picked up and carried with the water. In some cases, 10 feet of stream bank can be lost in one storm event! Water Quality – There are two main sources of water quality pollutants in Iowa; nonpoint and point. Point sources can be traced back to a single location of pollution and are often easy to fix. Non-point sources are harder to treat because they originate from multiple points on the landscape. In the rural areas, most of the pollutants come from nonpoint sources such as stormwater runoff from farm fields and lawns as well as discharge from tile lines and septic tanks. Due to the vast change in Iowa’s landscape, rain water is not able to infiltrate into the soil like it used to. This, paired with our increased heavy rains, leads to more water running quickly across the surface picking up pollutants and sediment along the way. This water is then discharged directly into our rivers, lakes, and streams. Increased nitrogen and phosphorus in our surface waters is having a negative impact on our environment. While these nutrients are essential to many natural processes, too many can be detrimental. The negative affects are being seen on both a local and nationwide scale. 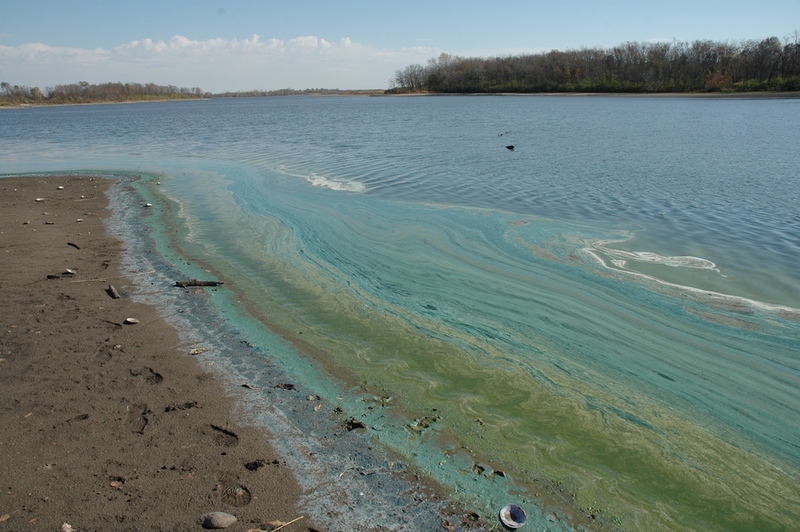 Harmful algal blooms leading to fish kills and beach closures are a common site throughout the Iowa summer and increased nitrogen in our drinking water is causing health concerns. 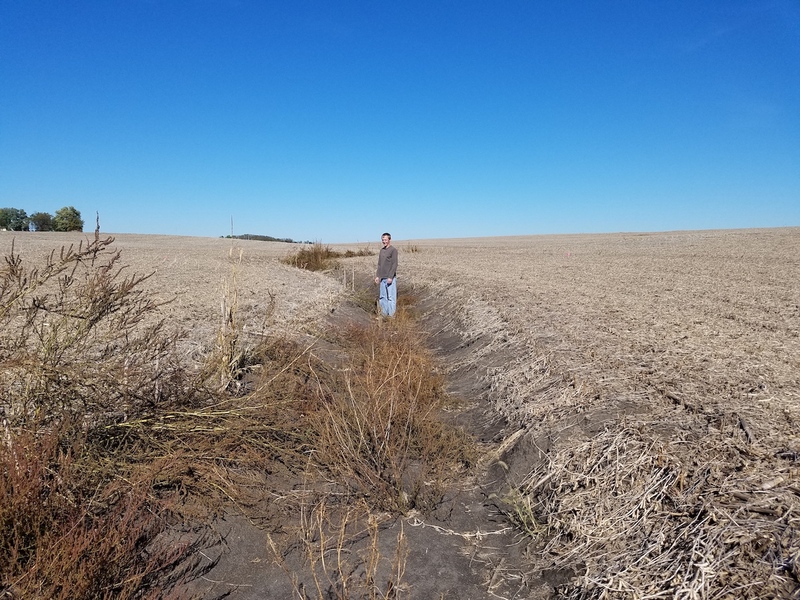 On a national scale, Iowa’s excess nutrients are contributing to the creation of a large hypoxic or “dead zone” in the Gulf of Mexico where nothing can live for portions of the year. Along with excess nutrients, excess sediment from stormwater runoff is also having a negative impact on our water sources. Too much sediment can lead to declining aquatic species habitat by causing low visibility, decreased light penetration, and increased sediment deposition in our lakes and ponds. Harmful pollutants such as metals and bacteria can also attach to sediment particles, increasing their transport in our water systems. Soil Health – Degradation of the soil that is still in place on the landscape is also a problem seen in our rural areas. This degradation is mainly due to current farming practices and changes in the landscape. Healthy soils are needed in order to continue to produce crops. When the quality of these soils is degraded, more fertilizers are required to maintain crop productivity. This increases farmers expenses and the risk of excess nutrients in our waterways. Most of these problems seen today are directly related to human sources. Luckily, there are many ways we can all work to fix these issues and improve our environment. Visit the “solutions” section to learn what you can do!